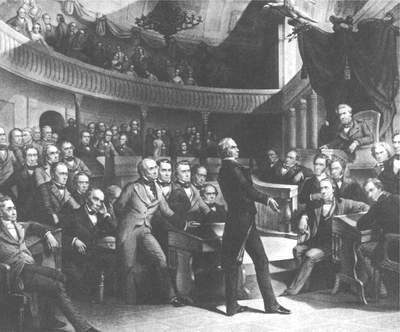 The Missouri Compromise, negotiated in large part by Kentuckian Henry Clay, helped to make sure that America avoided war. However, in 1848, America gained large amounts of land from Mexico. The Utah Territory and the New Mexico Territory as well as California were won from the hands of the Mexican government. All three of these regions were both above and below the 36 30 line. America was divided about what to do with this part of the continent. Furthermore, there were three other problems as well. In all, there were four main problems worsening relations between the North and South. 1. Abolitionists wanted to stop slavery in Washington DC, 2. some Northerners were assisting runaway slaves which angered the south, 3. Congressman David Wilmot tried to pass a law banning slavery from lands gained from Mexico (the Wilmot Proviso), and 4. California wanted to enter the United States as a free state. All of these major conflicts had to be resolved in order to avoid war. The Compromise of 1850 would attempt to solve these problems. Who helped to negotiate the Missouri Compromise of 1820? In 1848, from whom did America gain large parts of land? What three regions were above and below the 36 30 line? What were the four main conflicts that were brewing between the north and south? True or False? Congressman David Wilmot tried to make the new land free of slavery. What was the name of the Compromise that would try to solve these problems? In 1848, Texas gained independence from Mexico. Because of this, there was a lot of new land in the United States. Soon after the start of the Mexican War, when the extent of the territories to be acquired was still unclear, the question of whether to allow slavery in those territories polarized the Northern and Southern United States in the most bitter sectional conflict up to this time. Since Texas was a slave state, not only the residents of that State, but the pro- and anti-slavery camps on a national scale had an interest in the size of the state of Texas. Texas claimed land north of the 36°30′ demarcation line for slavery set by the 1820 Missouri Compromise. What would be done with the other new lands gained from Mexico? Would they be slave or free? Further complicating matters was the fact that California wanted to be entered into the Union as a free state. The borders of California crossed the 36°30′ line going both above and below the line. Adding even more controversy, many Abolitionists, who were helping runaway slaves, wanted to outlaw slavery in Washington DC. The plan was set forth. The giants of the Congress — Calhoun, Webster, and Clay — had spoken. Still the Congress debated the contentious issues well into the summer. Each time Clay’s Compromise was set forth for a vote, it did not receive a majority. Henry Clay himself had to leave in sickness, before the dispute could be resolved. In his place, Stephen Douglas worked tirelessly to end the fight. On July 9, President Zachary Taylor died of food poisoning. His successor, MILLARD FILLMORE, was much more interested in compromise. The environment for a deal was set. By September, Clay’s Compromise became law. California was admitted to the Union as the 16th Free State. In exchange, the south was guaranteed that no federal restrictions on slavery would be placed on Utah or New Mexico. Texas lost its boundary claims in New Mexico, but the Congress compensated Texas with $10 million. Slavery was maintained in the nation’s capital, but the slave trade was prohibited. 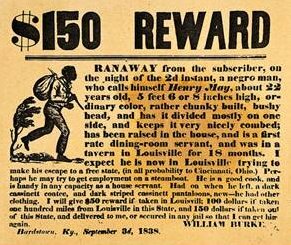 Finally, and most controversially, a FUGITIVE SLAVE LAW was passed, requiring northerners to return runaway slaves to their owners under penalty of law. Of all the bills that made up the Compromise of 1850, the Fugitive Slave Act was the most controversial. It required northern citizens to assist in the recovery of fugitive slaves. It denied a fugitive’s right to a jury trial. (Cases would instead be handled by special commisioners — commisioners who would be paid $5 if an alleged fugitive were freed and $10 if he or she were sent away with the slave owner.) The act called for changes in filing for a claim, making the process easier for slaveowners. Also, according to the act, there would be more federal officials responsible for enforcing the law. For slaves attempting to build lives in the North, the new law was disaster. Many left their homes and fled to Canada. During the next ten years, an estimated 20,000 blacks moved to the neighboring country. For Harriet Jacobs, a fugitive living in New York, passage of the law was “the beginning of a reign of terror to the colored population.” She stayed put, even after learning that slave catchers were hired to track her down. Anthony Burns, a fugitive living in Boston, was one of many who were captured and returned to slavery. Free blacks, too, were captured and sent to the South. With no legal right to plead their cases, they were completely defenseless. Passage of the Fugitive Slave Act made abolitionists all the more resolved to put an end to slavery. The Underground Railroad became more active, reaching its peak between 1850 and 1860. The act also brought the subject of slavery before the nation. Many who had previously been ambivalent about slavery now took a definitive stance against the institution. The Compromise of 1850 accomplished what it set out to do — it kept the nation united — but the solution was only temporary. Over the following decade the country’s citizens became further divided over the issue of slavery. The rift would continue to grow until the nation itself divided. What year did Texas gain Independence from Mexico? Why was California becoming a state controversial? What happened to Zachary Taylor that allowed the compromise to take place? How much did Texas receive in compensation for giving up New Mexico? What did the fugitive slave law require of Northerners? Which side do you think got the better deal? Why? Why did the commissioners have an incentive to send supposed slaves with slave owners? How many African Americans moved to Canada? Why did they move there? Why were free blacks not able to fight their cases? What reached its peak between 1850 and 1860? What was the major accomplishment of the Compromise of 1850? 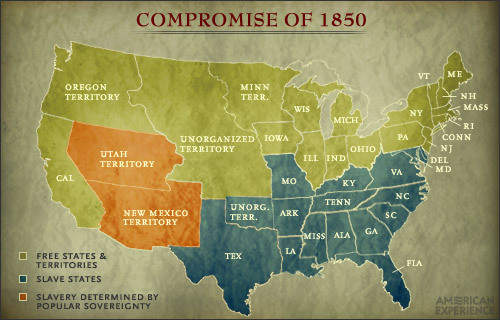 What would you change about the Compromise of 1850 to make it better? With the Teammates at your table, determine whether or not the document was created by a Slave Owner or an abolitionist. Please explain your reasoning. Document Number Was it created by an Abolitionist or someone who is pro-slavery? Why?